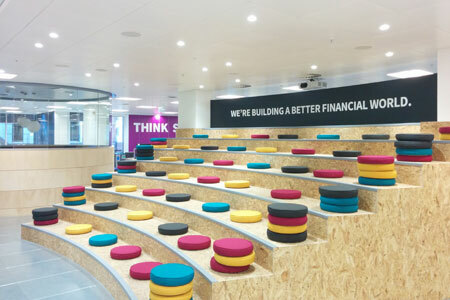 This year WE have been working with Funding Circle on the development and implementation of the furniture for their new offices on Queen Victoria Street. The project started with some very clear guidelines on the styles they wanted to achieve, although there were some challenging implications with regards to budgets and lead times. In addition to the tight lead times much of the procurement had to be carried out through the summer which involved a number of summer factory shutdowns. Working closely with Funding Circle, WE carried out a number of showroom visits over a very short period of time and managed to fine tune the selection criteria. As well as being a relatively large project of over 360 workstations, there were a number of additional aspects to it involving everything from the workstations and cable management to a variety of meeting spaces, breakout spaces and several types of storage area. I will deal with these in more detail in later blogs. The workstations themselves were a bespoke version of the Blok desk range with a walnut top and graphite panel legs. The task chairs were the Sentis chairs with additional finish options to give them a more bespoke feel. As the project developed WE were able to help in additional areas such as supplying the Buzziskin product to go onto the bespoke joinery areas and meeting hubs created by Maris Interiors. WE were also able to supply and install the bespoke cushions on these areas as well as in the auditorium space. One of my favourite areas of the space has to be "Funderbar" where we installed some special bespoke height UR tables and some bright Orange Miura bar stools to help create a fun restaurant and bar space with a great industrial feel. This was a great project to work on and we had a lot of fun developing the plans. We think the client liked it too from their testimonial !